The run up to Christmas is the perfect time to clear out and declutter. Out with the old to make space for the new. It was always traditionally my big annual clear out, like a home reboot as my Mum used to fly over from Ireland every year on Christmas Eve. Her housekeeping standards are way in excess of mine. I worked very long hours pre-kids and it took something like my Mum arriving for me to look to home, rather than office priorities. But it's been several years since she's visited at Christmas and we normally go to my inlaws now for Christmas, so my annnual spruce up sadly hasn't been a priority. I know nationwide though that people are getting sitting rooms, spare/guest room(s) and dining rooms ready for visitors over the festive season. My current Autumn/Winter declutter has come way sooner than December though due to an imminent date in the diary for my Lottie's Christening: 26th November. I can't wait to share photos of that when the time comes. She has 2 dresses and they're both incredible. Thanks Grandma. 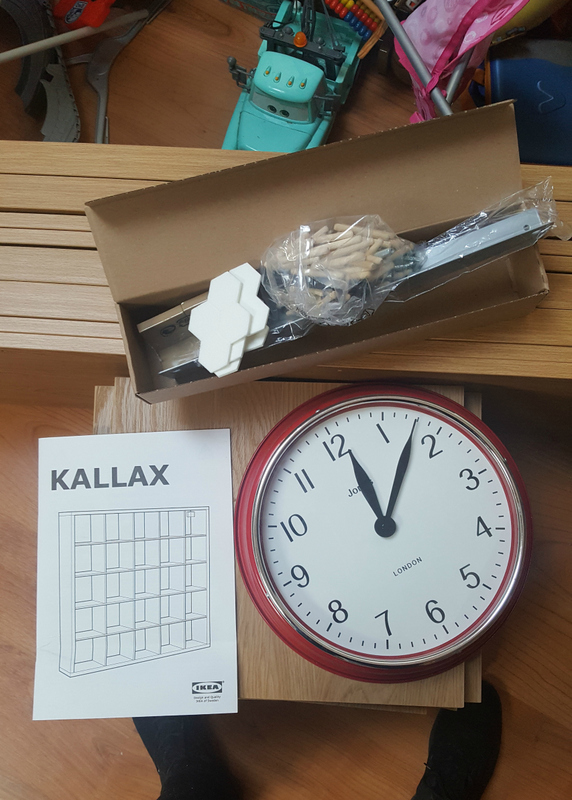 So I've wanted Ikea's Kallax as a way of storing and organising toys for 3 years now and I finally bit the bullet and bought a 5 by 5 and wasn't at all disappointed. If you are pregnant and reading this, think toy storage before the little one is even born; I wish I had done. I've been dealing with the mess of toys now for 7 years but no longer. Now all the toys have a home tidying up is so incredibly easy. Even the kids enjoyed putting things back where they belong tonight. When you buy Kallax you have to decide how many cubes you want, baring in mind the space you have available. A lot of people seem to get low wide ones and use them as a kind of sideboard, with toys hidden in pull out fabric drawers on the bottom row and ornamental vases and succulents visible on the top. Lots of rose gold geometry etc... When people do get square Kallax units they tend to go 4 by 4 but I got the beast that is the 182cm square unit, 5 cubes wide and 5 cubes high - I did get the Oak Effect as I've just linked to as I knew it'd be near my dining table which is solid oak and they do indeed look good next to each other. It's certainly a statement piece. 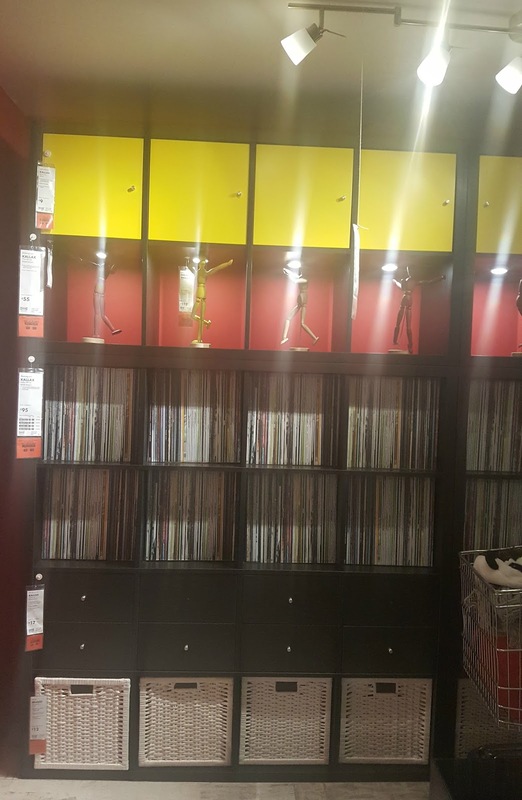 I've been reluctant to put CDs/DVDs or books on it purely because each shelf is so very deep (39 cm) you'd almost have to have 2 rows and then you'd not see what's at the back. Instead I've therefore left the books on their existing bookshelves and opted to use the Kallax purely for toys - it's a work in progress currently. My friend was laughing when she saw that I sometimes put just one toy on each cube, but I was just having a play with how it looks. It's all new to me. Oh but you need to know, choosing the size you can accommodate is far from the whole story, you also need to choose the accessories and this is where you need to have a budget in mind as it soon stacks up. Just sticking with pull out fabric containers as I have on my bottom row is the cheapest way to go as these are a very affordable £2.75 each and come in more than one colour. You can even get wicker ones that are £16 each. I was really drawn to what I saw in a display room as pictured above, so decided to invest in the cupboard doors and the double drawers. 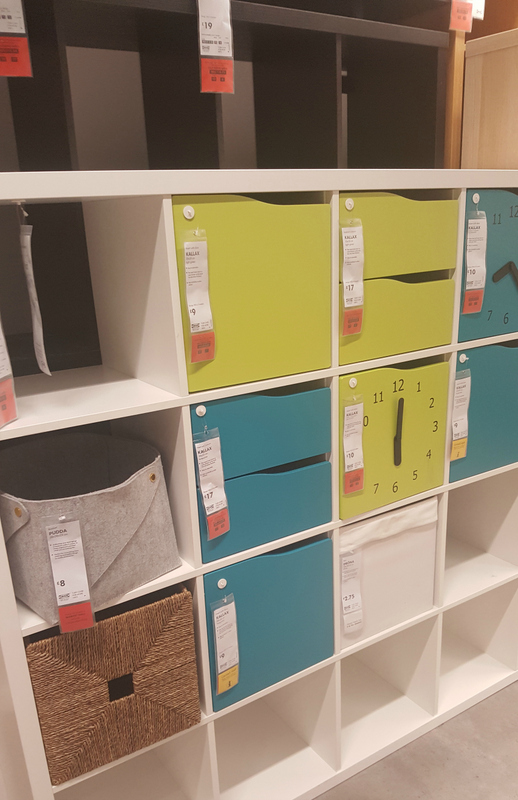 Show's that aspirational lifestyle showroom that you walk through in Ikea really works. I find it really inspiring. I am very visual and need goals that I can see in my mind. The end result is what motivates me to begin. The main driver for a big reorganisation was not only the Christening and the thought of guests arriving but also a wish for our sitting room to be relaxed enough to be Winter style cosy. After all we've swapped hours in the park in the sun for hours spent indoors so they may as well be chilled and relaxed. In a calming neutral environment that's pleasing to the eye, that doesn't constantly say "tidy me tidy me tidy me". 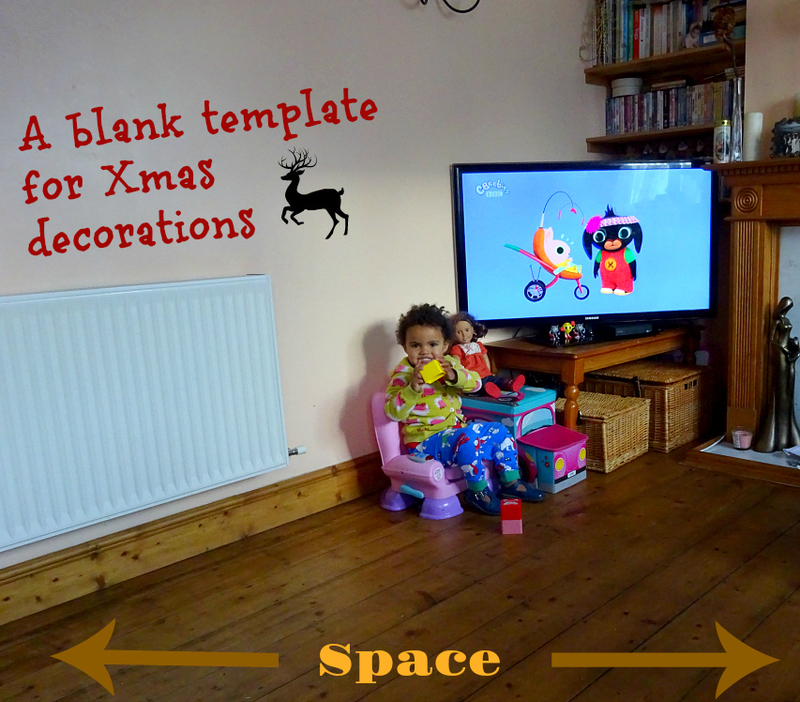 Also of course putting Christmas decorations on top of what is already a cluttered space is not going to be a good look. Tone it down ready to ramp it right back up. I love Christmas. As you can see above I have left them with a little nook near the TV. The small hamper holds Lottie's toys and the bigger hamper all of Aaron's cars. I found the gap between the TV table and the radiator was too large so I brought Lottie's pink chair back in as she loves sitting on it and we got that pink car toy box in a charity shop recently. She gets the bits that are in there out everyday so I'll always now make sure what is in there is rotated, current and age specific. Current favourite being shape sorter cubes which you can see in front of her feet. aThere is a shape that pulls in and out of each cube and they're stackable (a great car boot sale find). The dolly on top of the toy box was from Santa 2016 (when I asked Daddy to buy her a baby and he bought her a doll as big as herself). 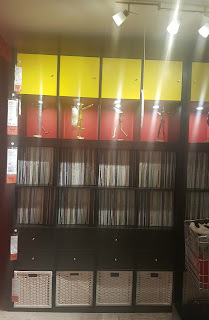 The shelves above the TV used to have lots of board games on and it looked truly awful so now it only has very tidy books and DVDs and all the clutter that was popped on the shelves with them has been removed. It's so very tempting when you are hoovering though to pop little bits and pieces on that wood that is in front of the DVDs and books and I do that all the time with it really building up. My friend said I should pull the books and DVDs to the front of the shelves but I am undecided about that as I like how it looks. All of the primary coloured "plastic-fantastic" toys you see above the Kallax (MANY very nicely out of sight in the bottom row pull out boxes) used to be in the sitting room: Playmobil huge Castle, garage, 2 x Fisher Price farms, a whole Spaceship set of Early Learning Centre Happy Land (which takes up a whole fabric box all by itself now), tracks both rail and road, cars, trains and dolls houses. They really detracted from any semblance of calm and at a time where minimalism and hygge are at their peak too. Plus the messy toys are often the cause of hubby's frustration and I don't like the way he puts them away which adds to the disharmony. I am not the sort of parent to say "go and play in your room" so whilst there are some toys in Aaron's room it doesn't compete with the large amount that are downstairs. I couldn't get rid of toys as Aaron grew out of them as I knew Lottie was on the way. Right idea too as she plays with EVERYTHING. My kids only really go upstairs when it's time for bed, or if they are having a little play whilst I put laundry away, or of course before or after bath time. They like to be downstairs with us and we like it that way too, so they'll either play in the sitting room or kitchen diner. We've never bought Aaron a Playstation or X Box so he doesn't go off to his room for that reason either. There'll be enough years where we'll lose him to a room, no doubt when he's a teen, so no reason to start it now, when he's only 7 years of age. Contentment and well being, definitely wanted me some of that. Plus there's nothing worse than wanting to hoover and mop and not being able to because there's a sea of toys. This clear out was meant-to-be though as we also started to have a problem with moths in the sitting room and so I wanted completely clear floors, with nowhere for them to hide. They like the dark and hiding behind/under things. Notably toys!!! Grrr! The drawers of the Kallax (I bought one row of their drawers, so that's five cubes but each one has two drawers so that's ten new drawers) once built and inserted will free up kitchen drawers as I'll have one for the cellotape, screwdrivers, lightbulbs etc... Then the deep kitchen drawers can accommodate things from the kitchen worktops so that I can really get that minimalist look with clean lines and clear shiny surfaces that I so desire. I've always wanted my kitchen to look like that but have spent 3 years trying to no avail. The counters always seem to have SO much stuff on them and even worse when we've just done a weekly food shop. You can see the boxes that house the soon to be built flat-packed drawers on the sofa, in the right-hand corner of the pic above. I was amazed at how quickly I fitted the carcass and cupboard doors. The 1st one was hard but then I got into my stride and did the remaining 4 in a couple of minutes each. 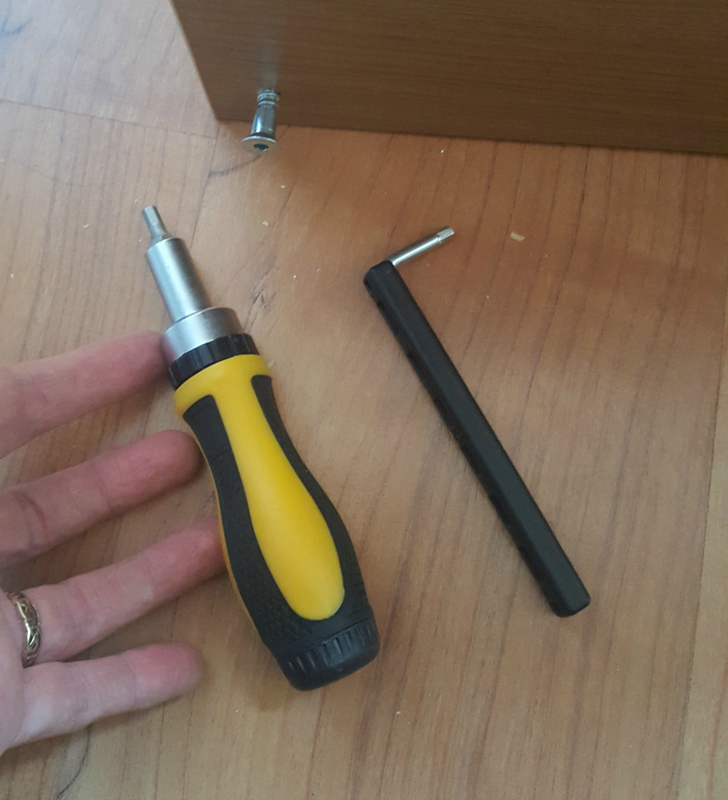 It was a little daunting at first as you have to screw into your lovely new unit, so unlike fabric pull out drawers the doors and drawers are more of a less flexible, permanent fixture. Even without the drawers (which I am yet to assemble and fit), because I have already fitted the cupboard cubes I freed up the dining table from things that had accumulated there. The kids found it a huge novelty eating supper at the big wooden clear table when we all too often eat in the sitting room with the TV on. 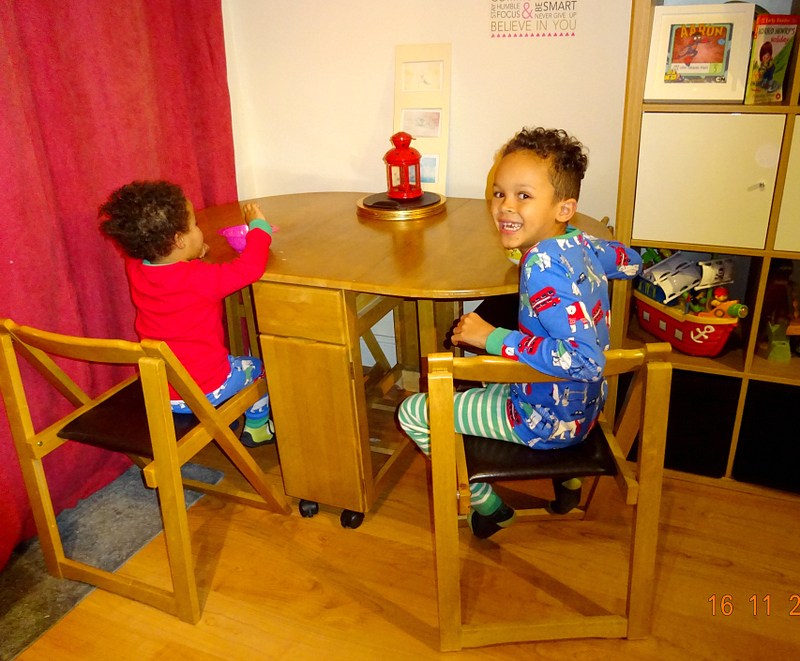 It was a delight to see them tonight sat at the table - the CLEAR table as I hope it will finally stay - with their matching PJs on. 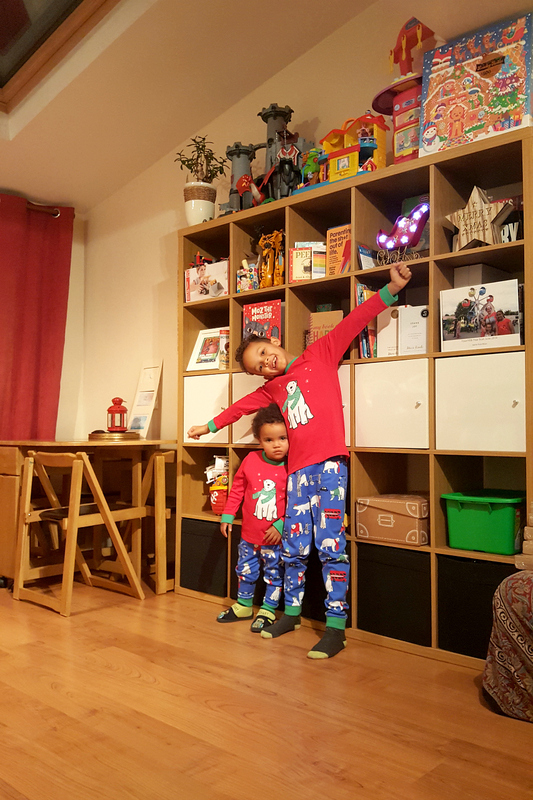 Last night I tried to get some festive pics of my two littlies in their festive matching PJs as above. 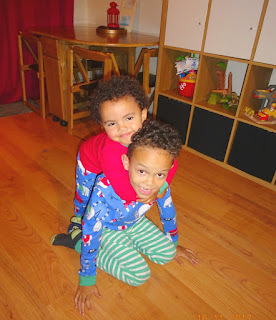 First time they've had matching clothes and my heart just about melted all over the floor. As you can see Lottie was in no mood to smile sadly. She has a rasping chesty cough which is really bothering her. We'd just got back from the shops and just had dinner here. She did get a second wind later, and was full of beans but by then Aaron was fast asleep. She was only up late as she had an evening danger nap instead of her usual afternoon nap which at 21 months is becoming increasingly common even though she gets up for the school run. I couldn't get a pic of them together this morning in natural lighting as she was still asleep when Aaron was up. They were turning the Christmas lights on at the mall last night about an hour after we bought these PJs but I decided not to wait on for it as Daddy was at work, meaning we'd be getting the bus and I didn't fancy my chances of getting the buggy on the bus if we left at the same time as the huge crowds. Shame though as the atmosphere was electric. Wow the queue at McDonalds alone was eight times the length I have ever seen it. But we picked up on the vibe and I am feeling very festive indeed now. As I am a clutter bug and a hoarder my dining table is always covered in paperwork or general "stuff" but it got housed behind the white doors of my Kallax. There's even a cupboard for Aaron's reception, year 1 and year 2 old school exercise books and Daddy has a cube he can empty his pockets into with change, car keys and stuff. Anyway, the main thing is the dining table is clear, which for Christmas is just perfect. My two loved having a pre dinner supper snack at the table last night. Such a novelty when we're so guilty of always eating in the sitting room. The dining room is open plan straight off the kitchen, so to bring meals just over to the table will be bliss. I am looking forward to doing that from now on, now we have a degree of organisation and it's spurred me on to do more. I have Ikea Pax wardrobes in the bedroom, 3 metres worth, that I bought in 2010, so I now want to empty and reorganise those. Feels great. This has more of an exciting feel than Spring cleaning too I guess because we are indoors so so much so get to really appreciate it. My task now is to keep it like this till Spring as I know what I can be like when I take my eye off the ball. I think pre-Christmas we will make another trip to Ikea as I am addicted to home improvements now. You'll see in the top right 2 cubes above I have festive ornaments that I just bought in the spur of the moment in the Factory Shop the other day, but the poor quality metal sleigh scratches my Kallax and has poor paintwork and the star, as gorgeous as it is, lights up so poorly you can only see it if it's black dark. Aaron does love turning them on when we get in though and off at bedtime, so I think I'll return them and see what Ikea has to offer in Christmas decorations. We bought all of our window lights in Ikea about 15 years ago and they're still going strong.